Saint Florian is the patron saint of firefighters, and many things associated with either fire or water. His feast day is celebrated on May 4. 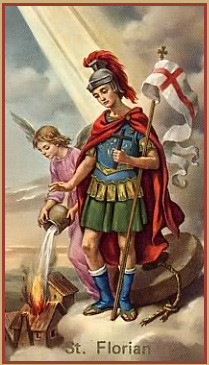 Saint Florian was born in the mid-third century A.D., perhaps around the year 250,somewhere around current-day Austria. He rose through the Roman army ranks to become a commander. Besides his duties to the military, he was charged with leading the firefighting brigade of the day. Florian was a Christian in a time when the Roman emperors were trying to eliminate Christianity throughout their realm. At one point he was ordered to offer up a sacrifice to the Roman gods, something in which he did not believe. Other stories state that he refused to participate in the ongoing persecution of Christians, in which the army had been ordered to participate. In either case, Florian's beliefs became known. When questioned, he again stated that he was a Christian. The popular method of disposing of Christians in that day was to burn them to death, and it was suggested that Florian suffer the same fate. He, however, stated his intention to "climb to Heaven on the flames" of the funeral pyre being prepared for him. The soldiers decided at that point to dispense with him via another route: he was flogged, then flayed, then a large stone was tied around his neck and he was thrown into the Ennis River to drown. A faithful lady recovered and buried his body, which was later moved to the Augustinian Abbey of St. Florian, near current-day Linz, Austria. In 1138 some of St. Florian's relics were given to King Casimir of Poland and the Bishop of Cracow. Since his relics arrived in Poland, he has beenregarded as the patron saint of that country. Because of his association with fire, St. Florian is the patron saint of firefighters and chimney sweeps and has been invoked for protection from both fire and water. A statue of St. Florian installed at the front of the main firehouse in Vienna, Austria survived a 1945 bombing with barely a scratch.